When it comes to weeds in the garden, I can’t think of one more beloved by gardeners than the milkweeds and for good reason. With their beautiful flowers and importance to butterflies, it’s easy to see why they are sought after and one of the best options in this grouping of plants is Butterfly Weed (Asclepias tuberosa). A native of Florida, Butterfly Weed is an annual spring to summer flowering plant with red, yellow, and orange-ish flowers. Growing up to 2-3 feet tall and wide, it does well in masses where it makes an excellent statement while in bloom. It also providing nectar for butterflies and hummingbirds and serving as a food source for hungry Monarch Butterfly caterpillars. After flowering, the plant is fairly plane looking and will die back in the winter. This plant can be excellent in the landscape but is not without its issues. Aphids, rusts, and leaf spots are common. Additionally, caterpillars may eat the plant to the ground when present. Avoid treating these plants with broad spectrum insecticides that may harm the insects you are trying to attract. 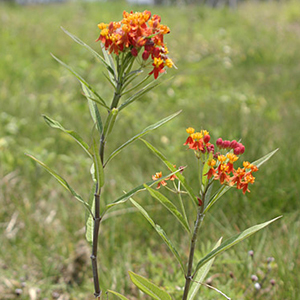 For more information on Butterfly Weed, visit http://edis.ifas.ufl.edu/fp050.